Nice one, I couldn’t believe they are the same size until I measured it. No, I believe you. They are the same size. But this is more comparable to the bull (or were they pigs? LOL! No, the bulls in the beer commercial poster or something) than to the Audi, I think. This is a good one. If I may guess, I think the blue one is the real Lamborghini, and the other colors are the photoshopped ones. Man. 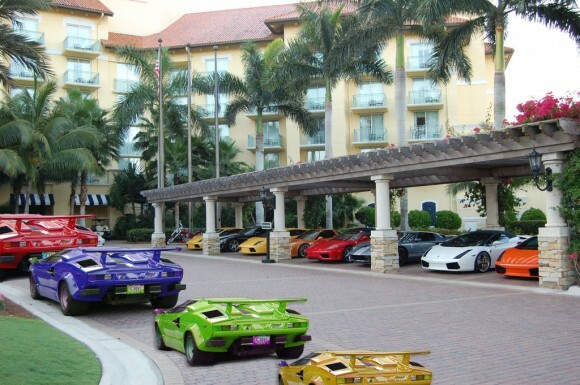 I would like to be the guy that has all these lambos. You get two benefits: 1 awesome cars; and 2 IT’S AN OPTICAL ILLUSION! It’s photo edited, all the same size cars but if you view the largest picture and look at the shadow of the cars you can see that it is edited. So no real fun this one. Could you please explain why our brain makes the images that would be further away in detail? I’m really fascinated and would love to know some science behind it. It really doesnt matter if the colours have been adjusted or even if the image has been composited, what matters is that the Lambo’s ARE the same size but don’t LOOK the same size. To be honest IMO this is no different to a drawn or painted illusion, its just using a different way of creating the image. exactly. People are so busy picking apart all of the small details that they’re not seeing the big picture or getting the point of the whole illusion…sad. I don’t get the point of this one. Nice car, but bogus images. They might be the same size, but the photo editing wasn’t done very well. Not up to your usual standards, IMHO. Our brains’ concept of perspective is based on the notion that objects that are closer appear larger and are measured relative to surrounding objects. The brain expects the yellow one to appear larger than the blue one because it is closer based on it’s position in the photograph. However, since they are the same actual size in the photograph the brain interprets that as meaning the yellow one is smaller. Also, the yellow car appears smaller in comparison to nearby objects, such as the cobblestones in the driveway, whereas the red one dwarfs the nearby palm trees. The un-altered line of cars to the right adds a further comparison of what the brain expects to see. The fact that it is photoshopped is irrelavent in my opinion. Bugger me, at first I just thought “what a pile of poop” – then read a comment, got a ruler out, and knock me down with a feather!!! Well duh, it’s obvious that it’s photoshopped. It’s supposed to be. The point is that all the cars are the same photo, except different colours and placed in different spots on the image. So don’t go around thinking you’re all smart like, ‘this one is a fake’ because you’re dumb and don’t get the point of it!!!!!!!!!!!!!!!!!! The illusion is that they are not lamborghinis, but bmws! The red one is the ‘original’ and the other three are altered in color. The best way to tell is the red tail lights with amber corners. And why do people join this site just to say how fake everything is? They are ILLUSIONS! They are, by definition, pictures that are supposed to look like two (or more) different things! Oh Internet, what has become of you! *Of course* it’s an edited photo people! For the Hidden Animal pictures, do you shout out “It’s a painting!” No, you sit back and enjoy the illusion for what it is. Thinking you’ve spoted the truth behind the illusion by playing the “photoshop” card just makes you look… well, as silly as those that insist on being the “First Post!!”. These particular types of illusions make my eyes hurt, this one included, so kudos Can, on a successful illusion. Odd looking effect here that stems from duplicating the cars in photoshop and then not correcting them for perspective as they are pasted back into the image. The cars are the same size but because our brain expects the one in the foreground to be larger, it appears smaller. To “photoshopped” or “fake” comments: Are you guys stupid or what? Read Vurdlak’s foreword for this illusion, why don’t you? Vurdlak clearly stated that this picture WAS photoshopped. It’s the same car (with the same license plate, that’s why he told you to check them out) duplicated and pasted there —> i.e: photoshopped! The point Vurdlak was trying to get through (that you guys apparently didn’t get) was: It’s not only the same car, it’s also the same size, even though you seem to see them to be different in size. The photo editing wasn’t done very well, not up to your usual standard? Who the f*** cares? That’s not the point! The point is, it’s an illusion of cars that seem to be in different size when they’re actually the same size. Your brain process the info received from your sight in terms of perspective. Example: from where you stand, object A is farther away than object B. For your brain to accept the fact or calculate that A is the same size as B, then A has to LOOK/SEEM smaller than B. Vice versa, if you see that A seems the same size or bigger than B, then your brain would automatically accept the fact that A is ACTUALLY bigger than B.
That’s why perspective has a big role in this illusion. You see the parking space with the roof? And the cars in it? That’s the most obvious perspective you see in this image. As you see the roof gets lower, the pillars and cars get smaller, your brain would automatically accept the fact that those objects are the same size. That’s why when you see four cars with the exact same size, your brain would automatically think that they’re NOT. That the red is bigger than the blue, and the blue is bigger than the green, and the green is bigger than the yellow. It’s because at the same time, your brain is processing the “correct” perspective sight right next to it. Click the “Relative Size” link on the Illusion Category on the right bar for other comparison. You WILL see that on this type of illusion, there’s always a “correct” perspective sight right next to the “different size” objects. I think original colour of the car is red, and the original position of the car is where the blue is. Thanks spider, that’s incredible. This has something do with what’s called constancy scaling then? Regardless, I get it now. Incredible. Love it. Thanks. And to all those that can’t help but point out it’s photoshopped, we know.. what’s your point? That’s the illusion fools. It’s like you guys think Photoshop is just some magical tool that makes all these crazy things possible.. really it is just like MSPaint on steroids. Which really is at it’s most basic a canvas and paint palette. Search for “Mona Lisa MS Paint” online, might change your view. Very clever, just goes to show you that we can confuse the brain until one really concentrates on what is there to what is not. please people, read what the author’s written b4 u start acting smart! ok, so it’s photoshopped, but doesn’t mean its fake! and look up the 2 words if u don’t know what they mean! i agree, its a perfect illusion and can be verified by replacing the background with plane white bg. A very sad attempt of a Photoshop. C’mon people. Why is there any discussion? Just put a piece of paper up to the screen, put the left corner of the paper on right corner of the left rear window then mark where the right side of the car hits the paper. Then check the sizes, they’re all the same size–photoshop or not.